Primary Inspired: Zippin' Down the Freebie Trail! Zippin' Down the Freebie Trail! I am SO excited to kick off this awesome Blog Hop!! Hope you have your baskets ready! There are 27 terrific bloggers stationed along this trail ready with some FABULOUS FREEBIES to fill those baskets! The fun starts today and won't end until the 30th! Each day, you'll find three or four new freebies on the trail. Make sure you check back each day and keep on fillin' that basket! How fun is that?!? I can't wait!! So, let me get this party started!! I'm excited about this Classifying & Categorizing Skill Building Activity Pack. 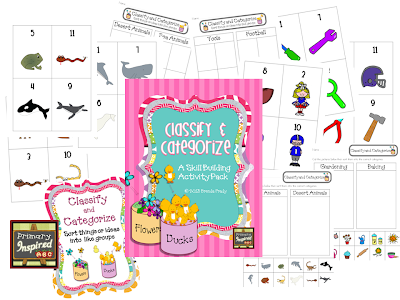 There's a super cute poster and 6 different activities to support classifying and categorizing. I hope you love it! Just click on the pic to grab it for your basket! Your next bunny hop stop is to Dilly Dabbles! Click on that cute little bunny & his car & zip on over there! What an AWESOME freebie!! Thank you so much for sharing :) I can't wait to zip down the trail and grab some more fabulous freebies! Thank you for the awesome freebie! I'm so excited to see all the freebies during this blog hop. Thanks for organizing! I was only able to get to a few of the blogs. Once I got to Learning With Mrs. Leeby, the page for zippin' down the freebie trail did not load. Could not go any further. Tried searching her site for the right page and couldn't find it. Linda-- this blog hop is happening across the whole week. There will be 3-4 new stops on the trail each day. Check back each day for more fun freebies! Thank you for the great freebie! What a fun way to find give aways. Lots of great freebies. Nice hop! LOVE the freebie! Thanks for letting me participate in this! I am excited!!! Thanks for this fun freebie! Awesome activity!! Thanks for the freebies! Thank you for this awesome hop and the freebie! I've also had problems going from blog to blog. I guess I have tried close to 10 times and hit dead ends. Is there a list of all the stops so I can do it that way? Thanks for all you do to help other teachers. Thanks for this freebie ... it came at just a great time! Thank you for the blog hop. I had a lot of fun visiting blogs I had never been to before! What an adorable freebie! Thanks girl!